One of the most anticipated sports cars of 2011 left our garage last week. The all-new 2012 Porsche 911 (991) Carrera S showcased its abilities to our team and it is time for us to report on our findings. Since its debut in 1963, the 911 has been one of the benchmarks in the world of sport cars and the vehicle has often been referred to as a dream for many petrol heads across the globe. After decades of development and six different generations the Germans have finally revealed the new 991, the seventh generation. Following the era of air-cooled models before 1998 and the liquid-cooled models – the 996 and 997 – Porsche developed a brand new platform, fourteen years after the release of the 996. The all-new 991 platform represents a complete redesign of Porsche’s rear-engined sports car focusing on greater performance and lower emissions, as well as finely resolved handling. The combination of aluminum and steel make an ideal mix of strength and lightweight construction, which will also be used in the upcoming Boxster and Cayman models. At first glance it may be difficult to spot the differences with the previous 911, which raises the running joke that the design department is one of the laziest in the industry. For Porsche-lovers this may feel a little offensive as they know that this particular brand favours refinement; following the traditions of a decades-old shape while trying to move the overall design forward. For those people not capable of seeing the differences, we are happy to point them out. First of all, just five percent of the parts from the previous-generation 997 were re-used. The 991 is longer, wider and lower than its predecessor. The wheelbase is close to four inches longer with a little more than two inches added to the width. The wheels have been pushed further out too, which makes a great-handling car perform even better. The rear wheels are closer to the engine, improving the balance and further reducing the effect of the rear-biased weight distribution. The front bumper received larger air-inlets, LED running lights and the remodeled exterior mirrors are now attached to the side panels again. 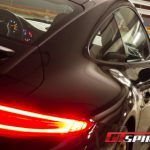 The easiest way to recognize the new 991 is at the back, where thin LED rear lights are found below an automatic or manually-operated rear wing. The Carrera and Carrera S are the first versions available in the 991 lineup. We drove two different models of the Carrera S; one with the seven-speed manual transmission and one with the automatic PDK-transmission. Both gearboxes are linked to the same incredibly responsive 3.8 liter flat-six engine producing 400hp at 7400rpm, and 325lb-ft of maximum torque at 5,600rpm. The 911 Carrera S with PDK manages to accelerate from naught to 100km/h in 4.3 seconds. 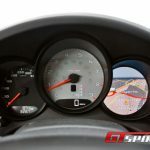 Pressing the Sport Plus button on the optional Sport Chrono package cuts that to 4.1 seconds (add 0.2 for manual cars). The top speed is 304km/h. The engine is hardly visible when you open the engine hood at the back. The Germans placed a cover on top which kills the fun of being able to show your friends what engine you are running. The combination between any of the two gearboxes and the engine is a positive experience while driving, but there are one or two remarks! The new PDK-gearbox offers ultrafast shifts and launch control which propels you forward easily from standstill. The manual transmission offers seven gears, of which two gears are simply overdrive gears to reach the higher economy figures. Still, it’s the world’s first seven-speed manual gearbox to be fitted to a production car. The choice between the two systems is a personal one. Personally, the manual transmission offers one gear too many. You simply won’t use the final gear when you hit the road. Only people on long journeys or on an economy run will shift upwards, but when overtaking is required downshifts to the 5th gear are definitely needed. The amount of rpm in 6th and especially 7th gear is so low, there’s simply not enough pace to overtake at highway speeds up to 130km/h. As you travel faster and increase the speedo speeds, 6th gear becomes useful and 7th may perhaps become useful as well, but many drivers will never get there due to traffic or local speed regulations. Even though the system works precisely and fluently, a short shifter would come in handy as you are changing gear so frequently. The automatic gearbox suffers a similar fate when the sport or sport plus button is not engaged. The immediate up-shifts to 6th and 7th are annoying at first and constantly ask for a decent amount of throttle response to get pace or a downshift via the buttons or paddle shifters behind the steering. Yes, those idiotic buttons on the steering wheel are still available on the 991. Paddle shifters are only available as an option. A start/stop mode and sailing options are available as well. Sailing means that at cruising speed when you release the throttle the gearbox goes to neutral to save on gas. The “green” characteristic of the gearbox luckily changes when one of the two sport modes is selected. The gear changes feel faster, the gearbox is paying attention and is not aiming for 7th gear constantly. The ultrafast down shifts help you when you need power for overtaking or sprints. Finally, the 911 wakes up! Unfortunately our favorite setup was not available in either of the cars. The most favorable setup would have been paddle shifters and the automatic PDK-gearbox with Sport Plus mode enhanced offering the best possible gear change in every situation. Any other combination falls slightly short of complementing the sporty character of the 911. The handling is a second clear difference between the older 997 and the new 991. The old 911 characteristic of a nose that bobs up and down and a steering wheel that needed a gentle touch to keep a straight line are completely gone. None of these historical “features” have found their way into the 991. Significant changes include a shift from hydraulic to electro-mechanical power steering and a new chassis set-up, which employs stiffer springs and softer damper settings than the previous 911. There is hardly any bodyroll. The steering is fast and sharp, quite similar to the 997 setup, but it has less feel and response. It feels slightly artifical offering less steering precision. The longer wheelbase and more equitable axle-weight distribution does as advertised and imparts greater stability. The 991 simply feels more grown-up, more competent, more sure-footed than ever before. Some purists would call it boring, we call it more sophisticated, easily capable of handling much more (Turbo, GT2, GT3, etc). Both cars were running on 19-inch winter tires, but normally you can get standard 20-inch wheels and tires. The fact that the 911 is a rear-engined sports car is immediately felt when it comes to the ride. In normal suspension mode there is some lightness to the steering feel. Bumps and small surface imperfections are hardly felt, deeper potholes reveal that it’s a sports car. As a whole it feels more than confident, but moving to Sport or Sport Plus provides an enhanced confidence without body movement and a sporty steering. The optional PDCC hydraulic active suspension system keeps the car flat to the pavement. Coming out of the corner it’s the Porsche Torque Vectoring (PTV) technology that encourages the driver to roll onto the throttle more aggressively than ever before. The interior has some Panamera-style to it, with a more enclosed and luxurious feel. The driving position is spot on, and the seats feel both sporty and comfortable. The rear seats are still useless and only offer space for a golf bag or two small kids. 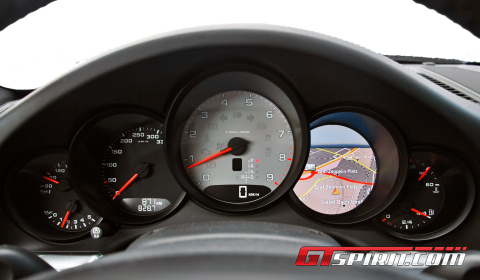 The driver is greeted by a five-gauge dash cluster, with the tachometer located front and center. The 991′s center console is topped with a navigation screen, followed by controls for the car’s audio system. The quality of the audio system is really nice and after some minutes searching you will be able to connect your Bluetooth-enabled phone to the multimedia system. Unfortunately, the steering wheel hasn’t changed much and you cannot opt for a multi-function steering wheel with paddle shifters. So what is good and bad on the car. The interior is an improvement over the older version providing a more luxurious cabin. The handling is much more refined and light-footed than before. The steering is precise and sharp. The fast-shifting automatic gearbox is a wonderful addition, same goes for the engine which is highly responsive and more fuel efficient. The manual gearbox would not be our immediate choice with an impractical “Going Green” seventh gear and high-positioned gear lever. 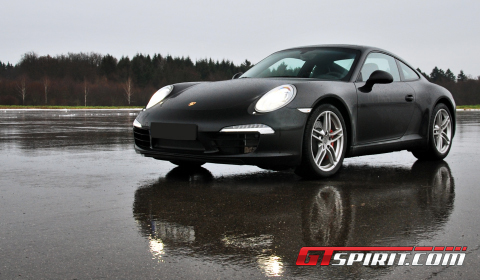 We would opt for the automatic, paddle shifters, Sport Plus, Chrono Package and the sports exhaust system offering an even better sound track than the stock version which sounds better than any Carrera before. Driving both gearbox types and experiencing the high levels of quality Porsche offers, we immediately agreed that the new 991 is the best 911 ever build. The most interesting question for most of you is; is it the most fun 911 Carrera S ever built? At this point our positive story changes slightly. This 911 doesn’t feel like a true sports car in its essence, more like an athlete wearing a suit. Luckily, underneath that suit there is a full box of sportiveness, but it is not always there in the Carrera S.
The 911 Carrera S is a wonderful sports car, but it offers a kind of luxurious perfection we did not expect to find in a 911. Luckily, there are sport modes with capabilities we really wanted to see. 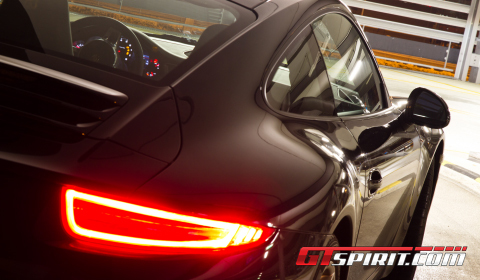 Those features are a must-have getting the full sporty package and true experience of a 911, but they come at a high cost. Although, the 991 is able to show you a sports car close to perfection, it is still not there, on the contrary it became more of a gran tourer capable of offering you sportiveness when requested. Not really our cup of tea, but definitely something the main target group would opt for.